The video was recorded by a diver from the group Mergullo Viveiro. A doctoral thesis reveals that there are up to 12 different species in the Vigo estuary and identifies where they live. Restaurants and octopus chefs apply increases of 15% while the cost of the product is doubled. The southern countries of the Atlantic area (Spain and Portugal) have begun to transfer their knowledge of cephalopods (mainly octopus, squid and cuttlefish) to France, the United Kingdom and Ireland, given the lack of knowledge and scarce consumption of these species in these areas. This initiative is part of the “Cehps & Chefs” project funded by the call for European aid of the so-called “Atlantic Area”, which supports cooperative projects of entities of the coastal regions of the Atlantic Ocean. An initiative, Cehps & Chefs, in which Spanish and Portuguese chefs will instruct their colleagues in France, the United Kingdom and Ireland on the gastronomic richness and culinary options of octopus, squid and cuttlefish, given the lack of knowledge and scarce consumption of these species have in those geographical areas. Spain and Portugal have begun to transfer their knowledge about cephalopods to France, the United Kingdom and Ireland to face the “ignorance and scarce consumption” of these species in these markets. In Spain and Portugal there is a great fishing knowledge, as well as an important habit of consumption and an outstanding gastronomy around the cephalopods. 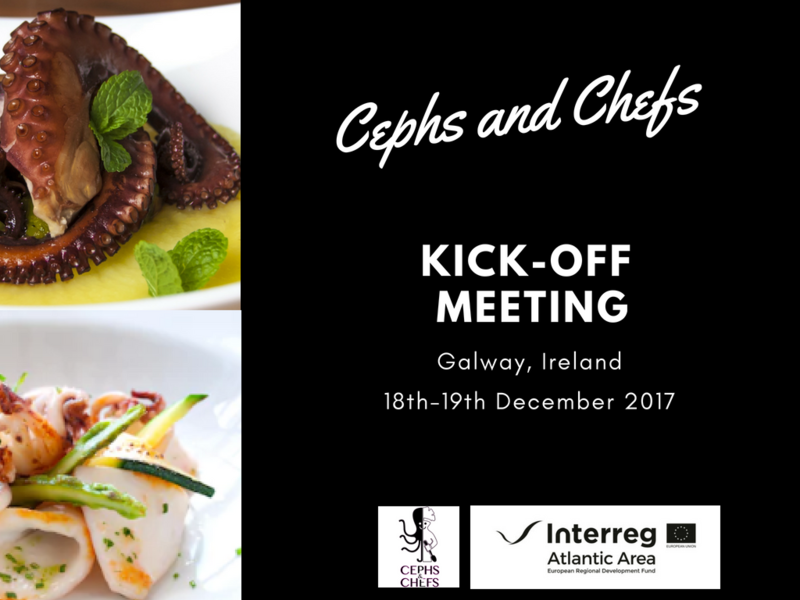 Therefore, within the project “Cehps & Chefs”, both countries have begun to transfer their knowledge about it (mainly octopus, squid and cuttlefish) to France, the United Kingdom and Ireland, where these species, on the contrary, are a great unknown . 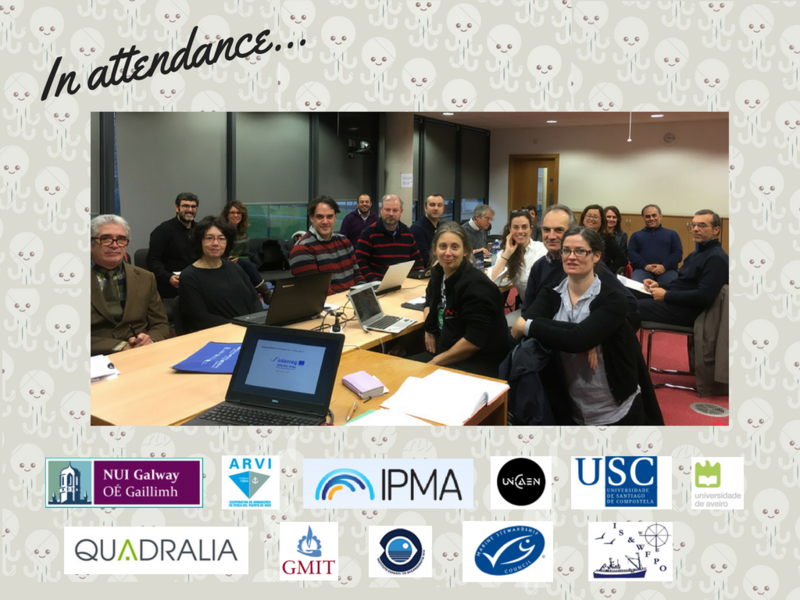 On 18th December 2017 took place in Galway the first Project meeting organized by NUIG (National University of Ireland Galway). The main objective of the project is to achieve knowledge generation in sustainable cephalopod fisheries development and transfer gastronomy and food culture from South European countries (Spain and Portugal) to North European countries (France, UK and Ireland). The project is co-financed by the European Regional Development Fund through the Interreg Atlantic Area Programme. During the kick-off meeting the WP leaders gave a presentation about the objectives, actions and expected results for each WP. Likewise the next steps for each action were defined. All these activities are aimed at reaching the objectives defined in the project like add value to cephalopods product, new markets initiatives, improve knowledge of the value chain and eating habits, and ensure sustainability of cephalopods fishing activities. The project will be beneficial for the entire European region since north European countries may introduce new gastronomic products, and south European countries may attract new gastronomic tourists based on these products. At the same time, fishermen of the European Atlantic area will have a wider market for their cephalopod catch, and improved knowledge about cephalopod fisheries sustainability. The next meeting will be held in Vigo in July 2018, in the days leading up to Vigo Sea Fest, which will be visited by the project partners.